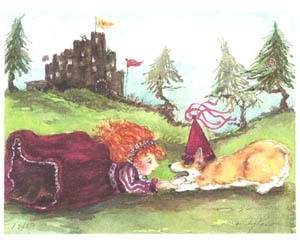 J. Carey Pedlow signed and numbered 8x10 inch water color print designed for the 2009 PWCCA National Specialty "The Royal Order of Corgis" entitled "Princess". Rich hues depict a young princess and her beloved Corgi Consort outside the castle walls. Tiny fairies riding their steeds and the Royal Corgi Guard atop the castle walls add to the whimsy and depth of this charming work.